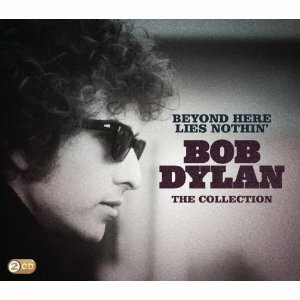 Bob Dylan is no stranger to greatest hits collections, but the newly released two-disk anthology, Beyond Here Lies Nothin’, is a fairly comprehensive look back at the career of the continually evolving artist. There may be no songwriter in our modern age that comes close to the impact Dylan has had on music and culture. With 34 studio albums recorded in the course of five decades comprised of a number of musical periods, any selection of songs may seem incomplete, but the 33 tracks on the new collection are proportionately representative of his career. All the well-known hits are included, from early folk songs like “The Times They Are A-Changin’” and “Blowin’ In The Wind” to his electric breakthrough songs like “Subterranean Homesick Blues” and “It’s All Over Now, Baby Blue” to 70’s classics like “Knockin’ On Heaven’s Door” and “Tangled Up In Blue” to more recent songs like “Jokerman,” “Make You Feel My Love” and the title track. The compilation also includes songs like “To Ramona,” “Watching The River Flow,” and “Po’ Boy,” which are lesser known but no less important or meaningful. The problem with any Dylan anthology is that it’s hard to summarize how an artist, at the age of 70, still remains relevant and whose fans tend to favor some musical periods over others. This is an especially good collection for new fans because it serves as a great reminder of why he’s such an icon.